Evolution of the stylized shell design begins in Georgian architectural details of Charleston. Elements of the shell design appear in the ironwork of the Dock Street Theatre as presented by local architect and architectural historian Albert Simons. 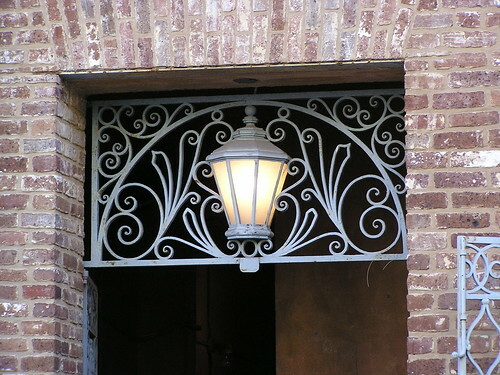 As seen in the earlier examples in Charleston and similar ones found in Bordeaux, this motif has long been familiar to Charleston's prolific builders and developers who imitated what they saw on frequent trips to European citys which depended on trade with 18th and 19th century Charleston. Miles Brewton, a merchant who traveled often to England and the ports of mainland Europe, brought back this fence from one of his trips while his grand townhouse was still under construction in the 1760's. Though the iron work may have been salvaged or just surplus, it became an iconic example and template for what Charlestonians demanded of their builders for generations afterwards. This particular shell design is now believed to have come from Bordeaux, where Brewton sold great quanities of Carolina Gold rice as did many others from Charleston. The shell design in iron and stone became the symbol of the religious pilgrims' route through central, northern and western Europe to the Shrine of St. James which was in northern Spain. The shell was the mark of St. James. Eventually it became a sign to religious travelers that they were on the correct road, many of which led to Bordeaux before reaching their destination in Spain. Charleston, SC. Photo taken 31 July 2004.